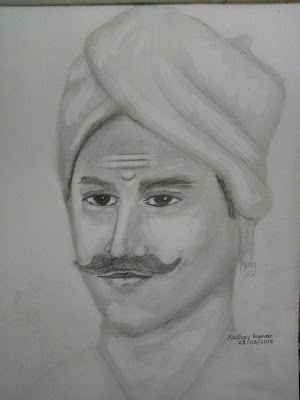 Mangal Pandey was born on July 19 1827 at Nagwa, Ballia District in a Bhumihar Brahmin family and died on 08 April 1857 at barrackpore. He was a sepoy in the 34th Bengal Native Infantry (BNI) regiment of the British East India Company. While British considered him as a traitor and a mutineer, Mangal Pandey is regarded as a hero in India. In 1984, Indian Government issued a postage stamp to commemorate him. This portrait of Mangal Pandey is created using HB and 6B graphite pencils on A4 Drawing paper.